This growing season I decided to plant Strawberry Popcorn. And no, the corn isn’t strawberry flavoured. There is actually a plant that is called Strawberry Popcorn. It’s an heirloom variety, producing rather small ears (3-5 inches) of corn, encrusted with these tiny ruby like kernels. I placed a whole ear of corn in the microwave to test it’s popping ability – as you can see, lots of the kernels popped right off the cob and the rest stayed on, blanketing the cob with a brilliant jacket of white, airy popcorn. It tasted great too – and best of all – it came from the garden. 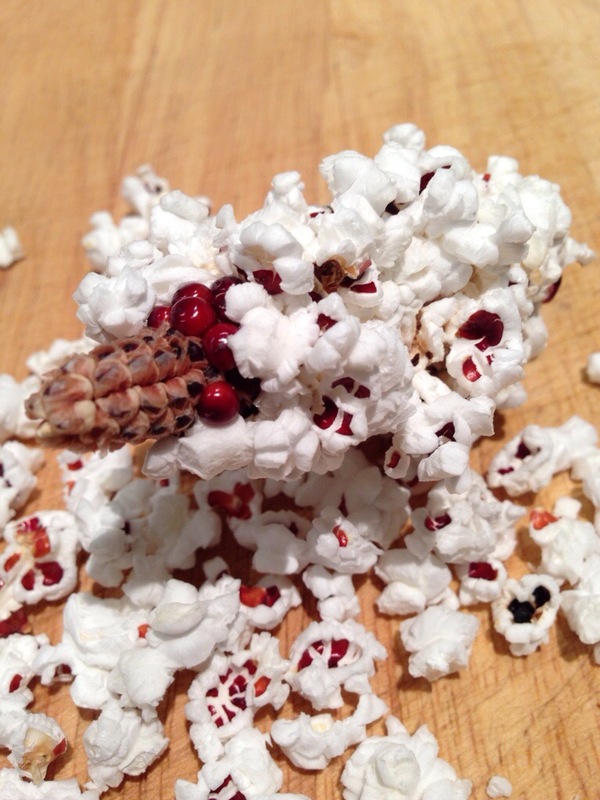 And I also must say – there’s nothing quite like plucking popcorn straight from the cob. You really begin to appreciate each kernel more this way – rather than blindly eating handfuls at a time in a dark cinema. coolest popcorn i have ever seen ! !